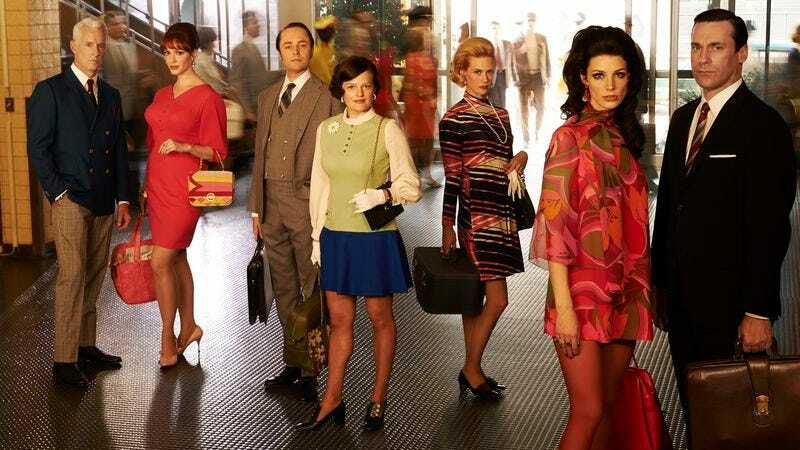 Who will walk through doorways during the first half of Mad Men’s final season? The Simpsons (Fox, 8 p.m.): This week, the show looks into the future—but not the future glimpsed in this Mad Men-style preview for next week’s episode, which officially heralds the end of that joke. Still, Dennis Perkins wants to know: What are you doing here? MTV Movie Awards (MTV, 8:30 p.m.): Join A.V. Club staffers for a livechat about the only red carpet event that can escape the tyranny of the Mani Cam. The Good Wife (CBS, 9 p.m.): Sunrise, sunset: Characters are born, characters die; law firms split, law firms merge. It’s the circle of life, and Sonia Saraiya moves us all with her analysis of it. Doctor Who (11 a.m.): Alasdair Wilkins just re-watched “Blink,” and now he’s giving side eye to every statue he sees. As well he should, because even statues that aren’t creepy aliens are still up to no good. The Simpsons (Classic) (3 p.m.): Erik Adams, Erik Adams / If you don’t review “Team Homer” / You’ll make us sad-ams. Anthony Bourdain: Parts Unknown (CNN, 9 p.m.): The first 24-hour news network shows a remarkable amount of restraint by not taking the title of Bourdain’s show—entering its third season tonight—as reason to send the chef on a search for the wreckage of Malaysia Airlines Flight 370. Nurse Jackie (Showtime, 9 p.m.): The show begins its sixth season with an episode titled “Sink Or Swim,” which is hilarious because there is no “sink” for a Showtime series that’s lasted this long. There is only unlimited renewals. The Bletchley Circle (PBS, 10 p.m.): Sonia Saraiya has watched the Bletchley Park crew’s latest crime-solving exploits, but she won’t tell you who did the biggest crime of them all. Okay, fine: She will say that the butler didn’t do it. Years Of Living Dangerously (Showtime, 10 p.m.): Come for the frank discussion of human effects on global climate change; stay (as Erik Adams did) for Harrison Ford acting as if global climate change is something he can correct through excessive grumpiness. Pacific Rim (HBO, 5:45 p.m.): Of course, if we fix what we’ve done to the environment, how ever will we open the inter-dimensional rift that will allow city-leveling kaiju to spill into our world? MLB Baseball: Red Sox at Yankees (ESPN, 8 p.m.): Boston and New York will meet in only 19 times this baseball season, meaning ESPN is particularly urgent to squeeze as many of those meetings into primetime. It’s a scene stealer’s holiday, with Erik Adams examining The Many Loves Of Dobie Gillis (and the many characters that swiped the spotlight from Dobie) for 100 Episodes and Will Harris doing a dyn-o-mite job talking Random Roles with Good Times’ Jimmie “J.J.” Walker. Saturday Night Live: Seth Rogen returns to Studio 8H, a return Dennis Perkins refuses to acknowledge without any encore performances from Jackie Snad and Clancy T. Bachleratt. Never forget the four things that make America great, kids: spaceships, toddlers, Model T cars, and jars of beer.